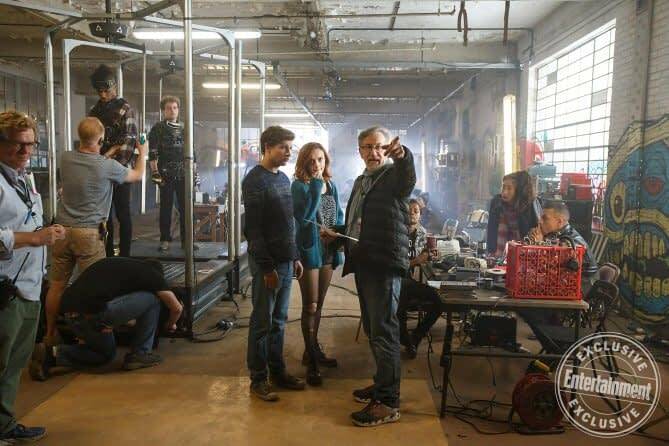 There was a battle on the set of Ready Player One and that battle was trying to get as many Spielberg references into the movie without the director, Steven Spielberg, from noticing. Spielberg had made some hugely iconic movies but he didn’t want anything in the movie referencing those movies. It seems his crew had other ideas as detailed in Entertainment Weekly. It turned into a game among the production to try and sneak in references without Spielberg noticing. They managed to sneak a gremlin in without the boss noticing. It wasn’t just about ego for Spielberg. While he knows he played a part in the culture of the 80’s he also believes that there is plenty of pop culture to put in the background of this movie. Spielberg wanted to make sure that while all the references are fun they aren’t the center of the movie. He wants the theme of escapism being a problem but a solution to be the focus of the movie. What Spielberg era Easter Eggs do you want to see in Ready Player One and do you think the production team managed to sneak anymore references past Spielberg? Summary: When the creator of a virtual reality world called the OASIS dies, he releases a video in which he challenges all OASIS users to find his Easter Egg, which will give the finder his fortune. Wade Watts finds the first clue and starts a race for the Egg. Ready Player One, directed by Steven Spielberg, stars Tye Sheridan, Olivia Cooke, Simon Pegg, T.J. Miller, Mark Rylance, and Ben Mendelsohn. It will be released on March 29th.